To receive further updates on this TJX Companies, Inc. (NYSE:TJX) trade as well as an alert when it’s time to take profits, sign up for a risk-free trial of Power Options Weekly today. This morning, I am recommending a bullish trade on TJX Companies, Inc. (NYSE:TJX), the parent company of Marshalls, HomeGoods, and TJ Maxx. Last Friday, I mentioned that my indicators are giving neutral readings, as the S&P 500 continues to run up against resistance just above the 2,800 level. Despite the upgrade from a more bearish market the week before, I recommended a bearish trade. 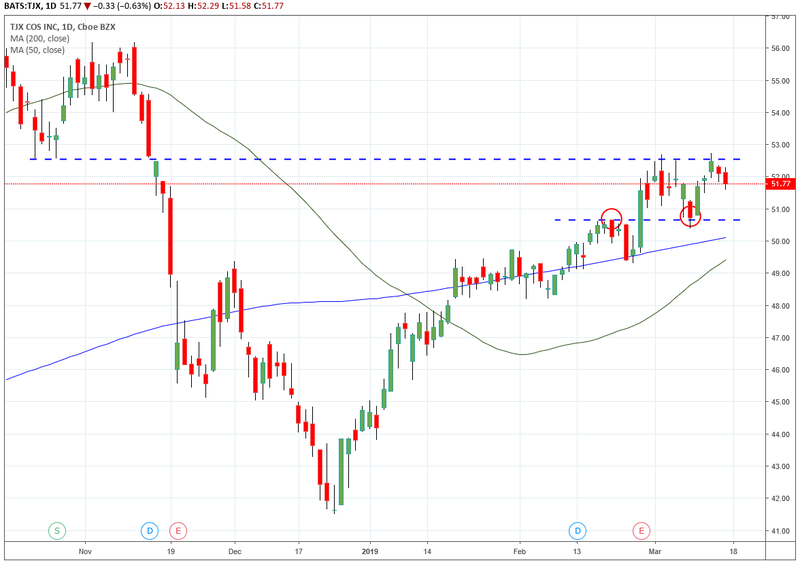 This week, I’d like to branch out in case there is a push to the upside, and I think TJX is a strong candidate for a bullish long call option. TJX is an off-price retailer or a discounter, buying excess apparel and home goods from department stores and selling them at a lower price to consumers. In general, retail hasn’t looked too strong the past few months. When looking at the SPDR S&P Retail ETF (NYSEARCA:XRT), we see it is trading between its 50- and 200- day moving averages. Back in February, news from the Commerce Department that retail sales in December were lower than expected caused analysts at JP Morgan (NYSE:JPM) to cut their growth estimates for the retail sector. But just because the retail sector is showing signs of weakness doesn’t mean every retail stock has to follow, and I like TJX’s technical picture. 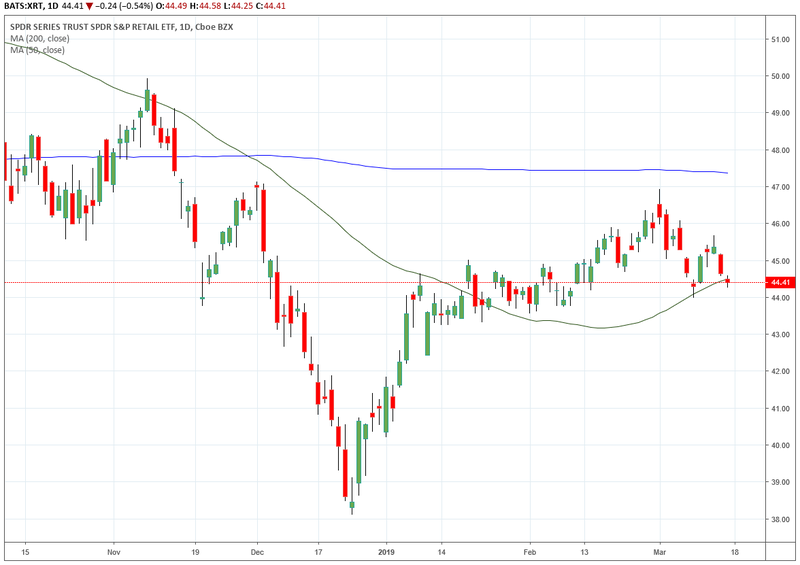 On the daily chart, we see that TJX has been trading above its 50- and 200-day moving averages consistently since late February. There is some resistance at the $52.50 level, but recently the stock was able to jump above resistance just under $51. That level then acted as support in March. And though TJX missed earnings per share estimates for the fourth quarter, the company did boast increased same store sales during the holiday season. That means its fundamental picture looks better than the previously mentioned mid-February data would suggest. TJX could head higher in the current market environment, and I recommend a bullish call option to take advantage. Buy to open the TJX Companies, Inc. (TJX) July 19th $55 Calls (TJX190719C00550000) at $1.35 or lower. InvestorPlace advisor Ken Trester brings you Power Options Weekly, which delivers 5 new options trades and his latest trading advice to you each Friday. Trester has been trading options since the first exchanges opened in 1973 with a winning streak that goes back to 1984 with money-doubling average annual profits since 1990. The post TJX Could Continue Higher Despite the Retail Sector’s Struggles appeared first on InvestorPlace.